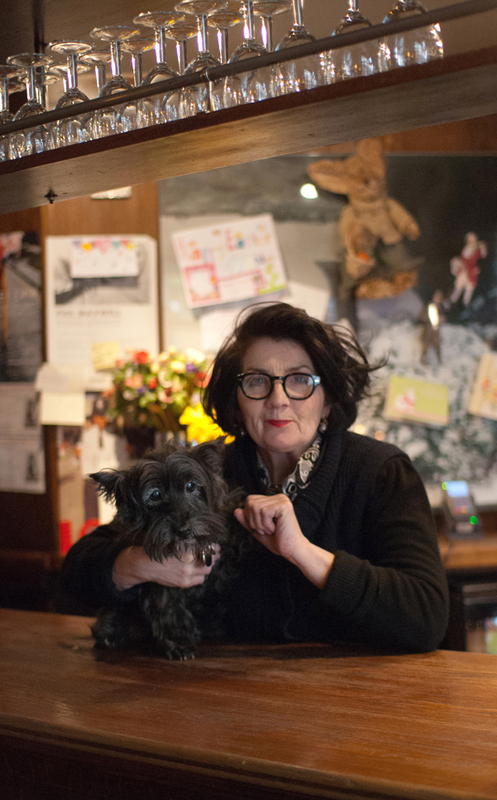 Spitalfields Life contributing photographer Sarah Ainslie and writer Andrew McCaldon have been out again, braving the April showers to continue their survey of East End canines. I originally come from Northern Ireland but I’ve lived here for fifty years. I came to do an apprenticeship as a plater at the Harland & Wolff shipyard in North Woolwich. I’d go out with the crane and set the metal plates on the sides of the ships for the riveters to attach. I’ve had quite a reasonable life. I still go back to Northern Ireland every year to see my mother –she’s ninety-three. She forgets I’m seventy-one, she still treats me like a boy. “We’ve not been together long, about five months. The first word my wife said to me when she saw her was ‘Missy’. She’s a bit of a looker, and she’s got a very mysterious look about her, in her eyes. She’s just an immense joy, I feel a genuine love for her. I went through four years of hell and without her I wouldn’t have got up in the morning. I worry now she’s getting old, I do. 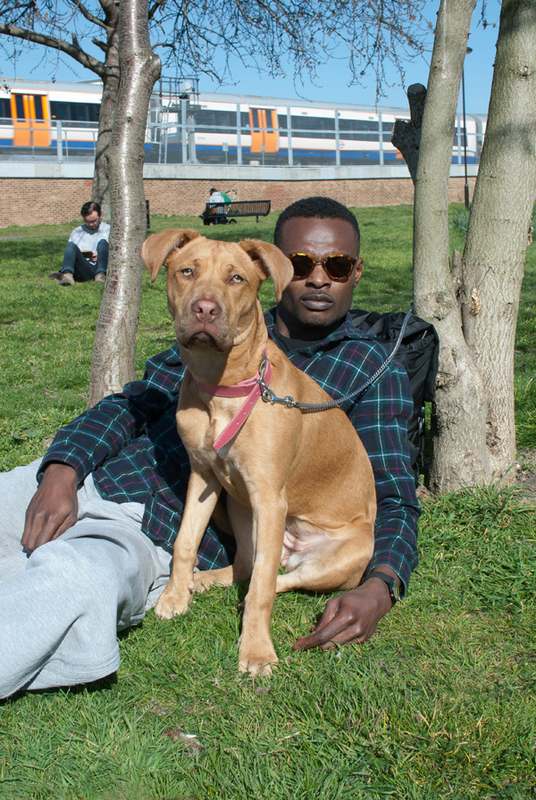 “I always dreamed of having a dog in Brazil but my Mum was allergic so I never could. When I came to live in London it was the first thing I thought about. Sally was my birthday present to myself. 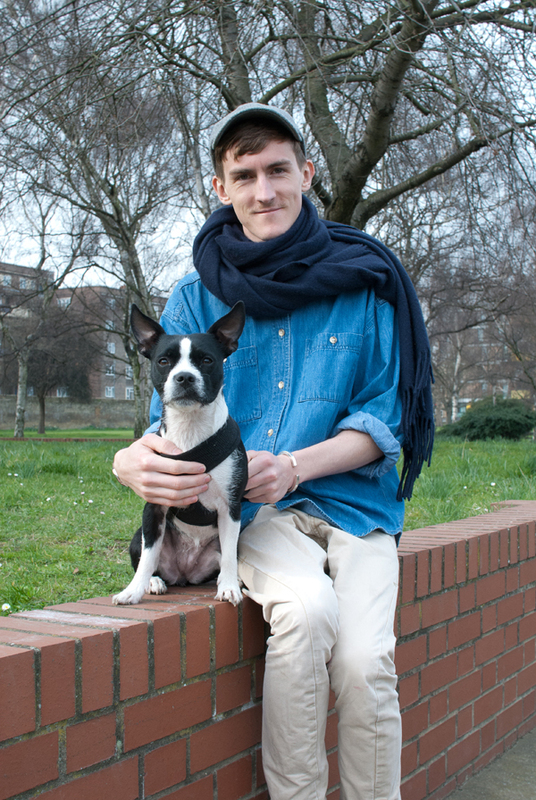 My boyfriend had a dog called Sally – he told me she died tragically when she was young. So he was the one who wanted to give our new dog that name too. If it was a boy I wanted to call him George because I like the way that sounds with an English accent. Before we had Sally – I don’t know why – there was too much focus on ourselves. Now that we have something else to think of, our relationship is more mature in a way. I always say we shouldn’t argue in front of Sally. “When he was young he had all the energy of thunder! Now, he’s eleven. He doesn’t care for orders anymore – he’s had long enough of being told what to do. Thunder’s one hundred per cent Italian and he lived for nine years in Rome. There are many more dogs in Rome than London, he had a lot more friends there. It was hotter though and he’s very furry so that was tough. He wants to be ‘The One’ all the time, he wants to be the protagonist. He likes lady dogs but we have trouble with the other men. 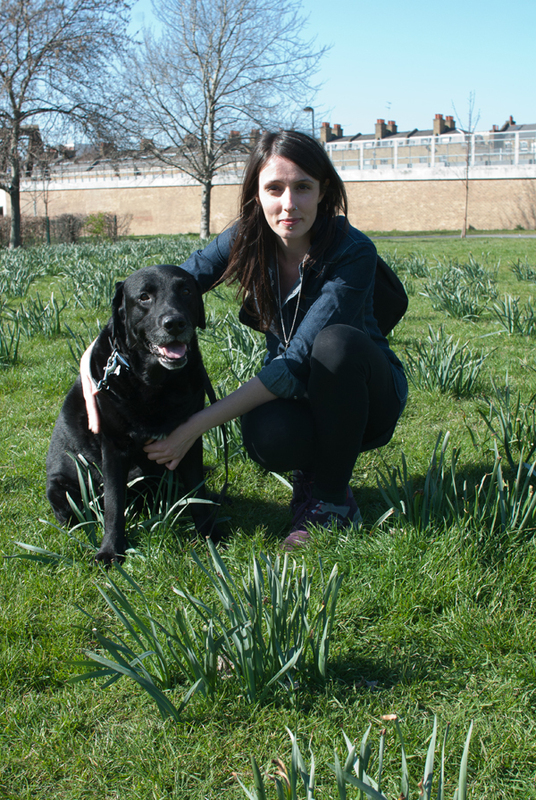 “My partner named her after Coco Chanel – she’s black and white, of course. She’s very loved and very spoiled but she’s worth it. Coco was the runt of the litter, the smallest and cutest. 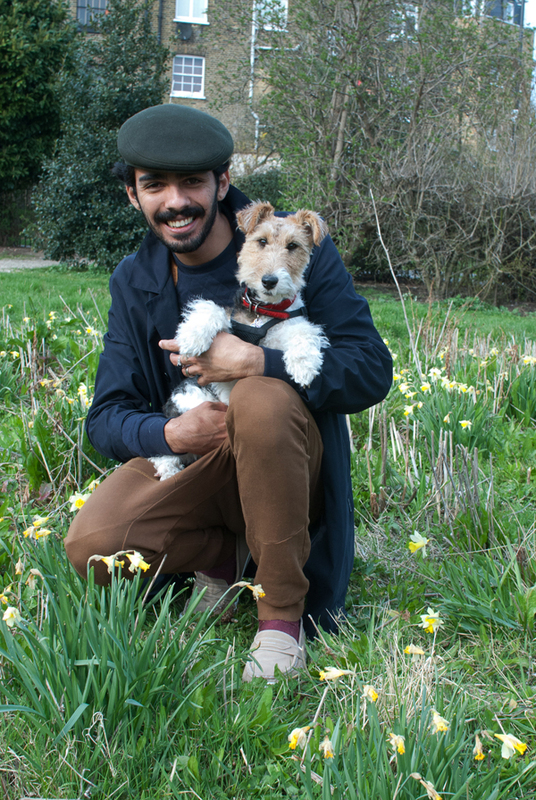 We didn’t realise what a responsibility having a dog would be – we learnt quickly that it’s like having a child. And I never would’ve sat in a park on my own before but, now I’ve got her, I do. It slows you down a bit too, makes you stop and go for a walk. “He was only born on the third of February – I’ve had him for two weeks. He’s such a lovely traveller, on the bus, in the car. We went on a three hour trip to see my family, he sat on my lap all the way with his head on my shoulder. He played tug of war with my son’s Doberman – and won. He’s a proper East End boy! I’ve been really ill with my breathing – but somehow, stroking him makes me relax and feel better. And after living here all my life here I’ll be moving up north with Krease soon. There’ll be a garden and woods for us both to go in. “I’ve lived in the streets round here all my life. I worked for a timber company on the Isle of Dogs – my father and my Uncle Sam did too. I was born at 54 Quaker Street, and back then as kids we used to take stray dogs home all the time. And I’ve had a collie before, in the early seventies. I remember going down to Club Row one morning with my daughter. ‘I want a doggie, I want a doggie,’ she kept saying and like an idiot I bought it for her. 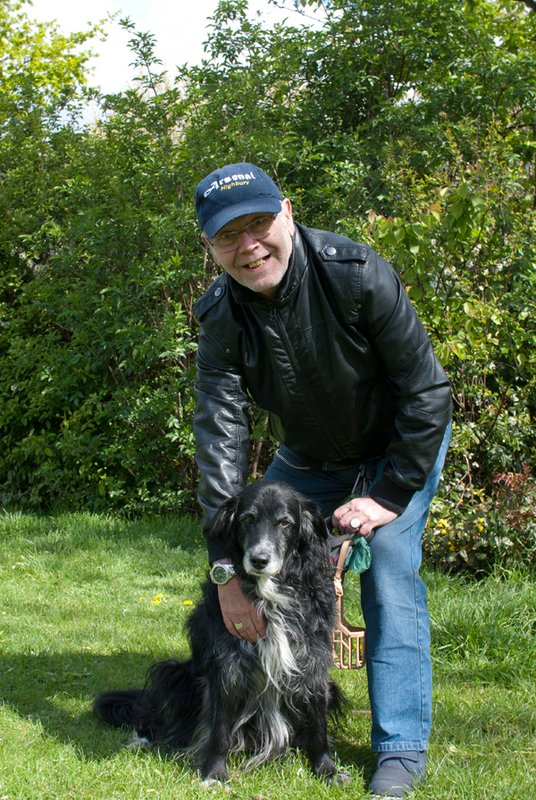 I looked after that dog – we called her Sheba – for sixteen years. Sherman’s eleven years old now. Some of my family think I’m crazy having another dog at my age. But when I was at The Dog’s Trust, they thought I might like Sherman, and so they went off and brought him out to show me. Soon as I saw him coming, I said to my daughter, ‘If that’s the dog they’re bringing for me, I’ll have him.’ Cost me eighty pounds. “He’s just seven and a half months, our family pet. Hugo knows certain words in Polish because we speak it at home, like sit –‘siat’, come here –‘choćt’, fetch – ‘przynieś’. But now we are in the park more, and people here speak to him in English so we’re teaching him that too. Last week I was serving dinner for everyone. Behind me I heard the sound of plates clanging on the table. I thought people had already sat down, I turned to tell them not to start yet but what I saw was Hugo – he had jumped up on the table and was eating the dinner. I kept saying to Molly, ‘Stop looking at me! 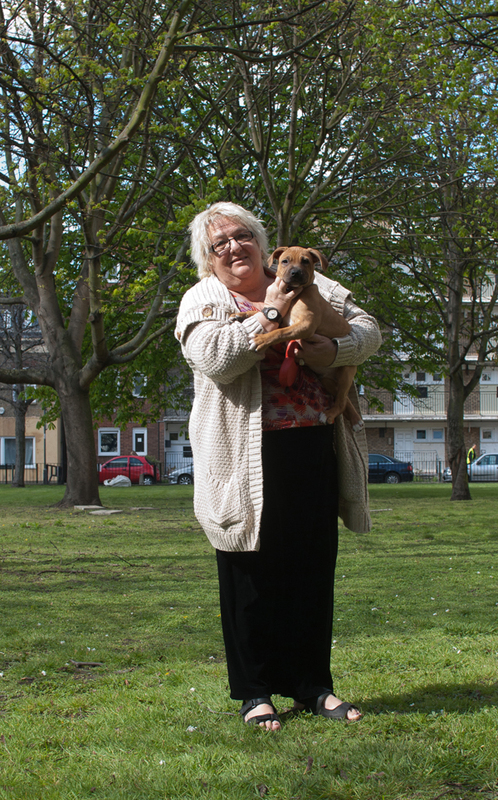 Stop looking at me!’ I rang the police, I rang Battersea – no one wanted her. And so she stayed. I always say she’s about a hundred! 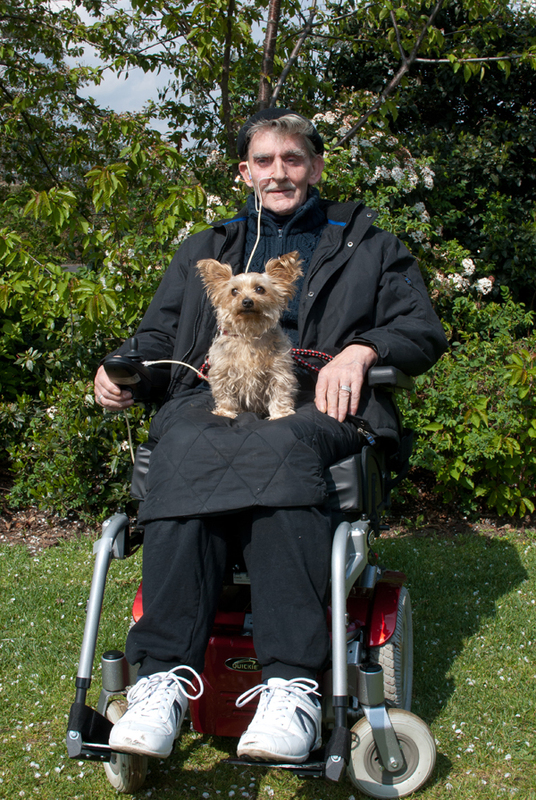 That’s how my husband Dennis got to know everyone, out walking Molly. Dennis was the love of Molly’s life. And he loved her too. What a glorious post! So much love. I am especially pleased by the terrific variety of dogs and their people. Such a remarkable place your Spitalfields. Reading this with our border terrier Millie asleep on the end of our bed after her morning walk! For those that have dogs they are definitely part of the family and keep us going! Thanks once again for a great post! Marvellous photos, lovely text. I love this series! I am writing this as my rather pampered KCS lies snoring at my feet. Lovely photos with great stories and a great collection of dogs. 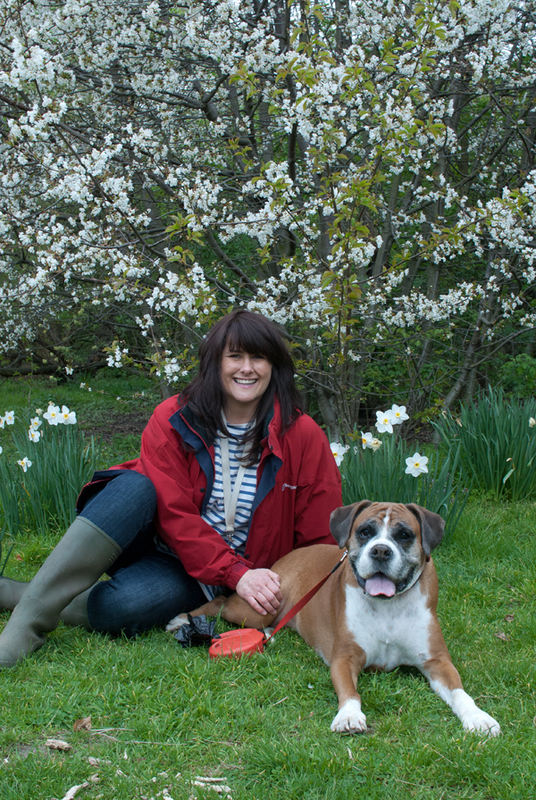 I especially loved the story of Molly and her kind owner…….great photo. they’re all heavenly, but paddy may be the cutest dog i’ve ever seen! those ears! bless their hearts! Hi Andrew and Sarah, thank you thank you, there are such few photos of Ruby and I and I am so very grateful you took an interest in our story…. sitting here in tears again, she really is so dear to me and James,and now we’ve shared her story. Continue in your great story telling with pictures, and I am spreading the word, hopefully we’ll see Alfie on the blog before too long. Again, thank you. kind regards, Bernice.